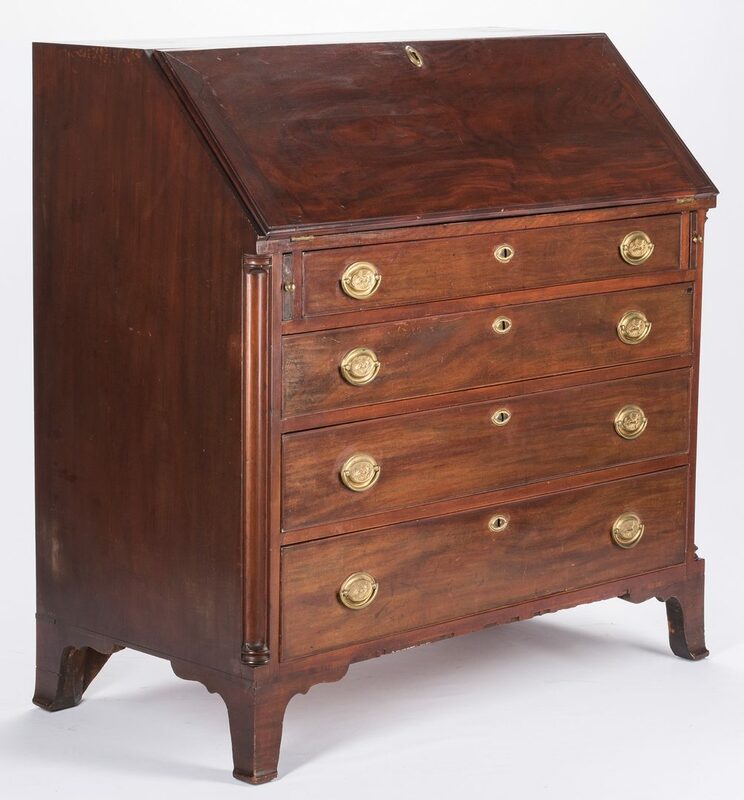 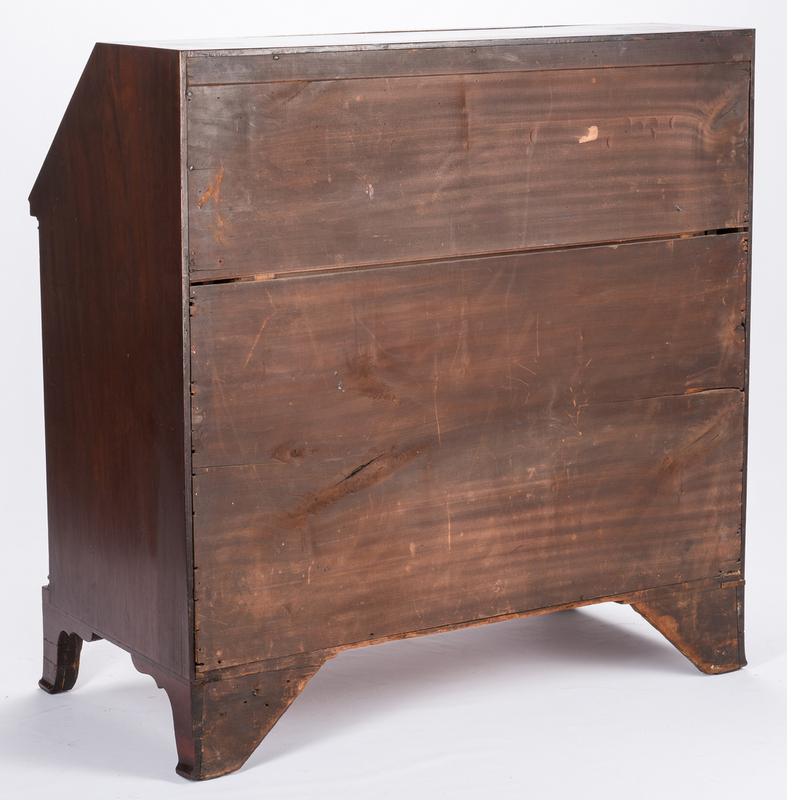 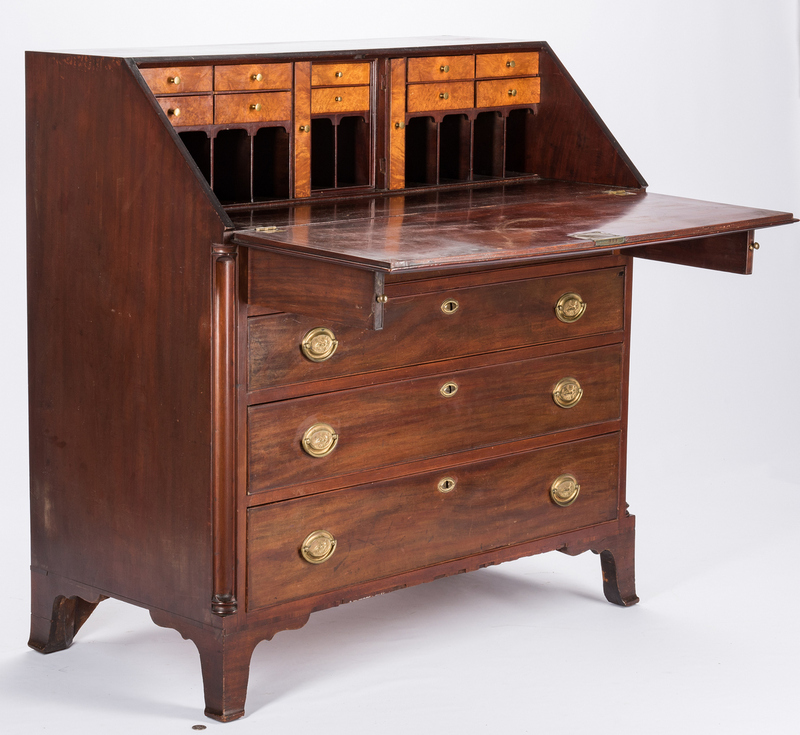 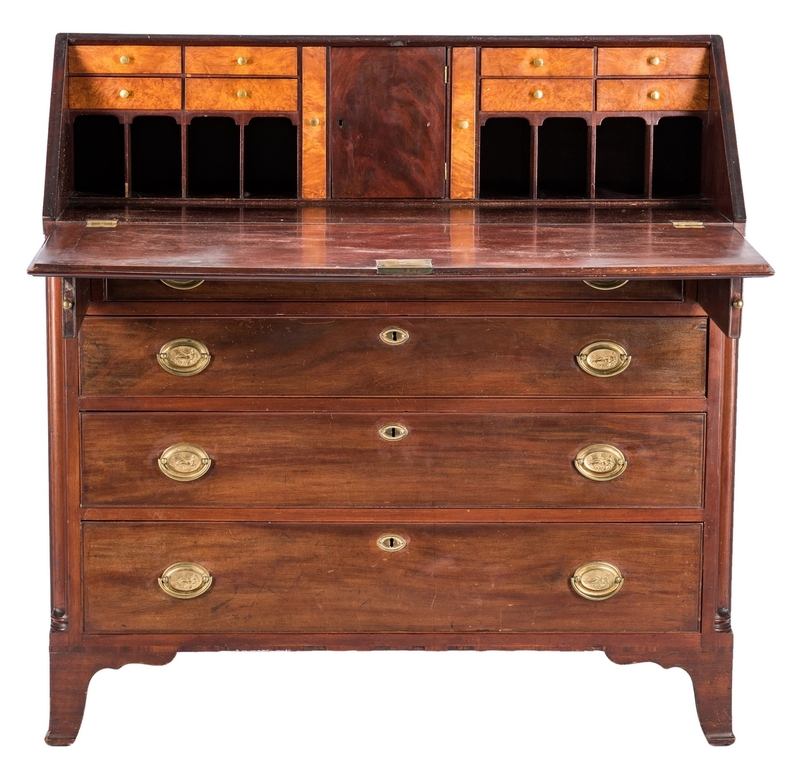 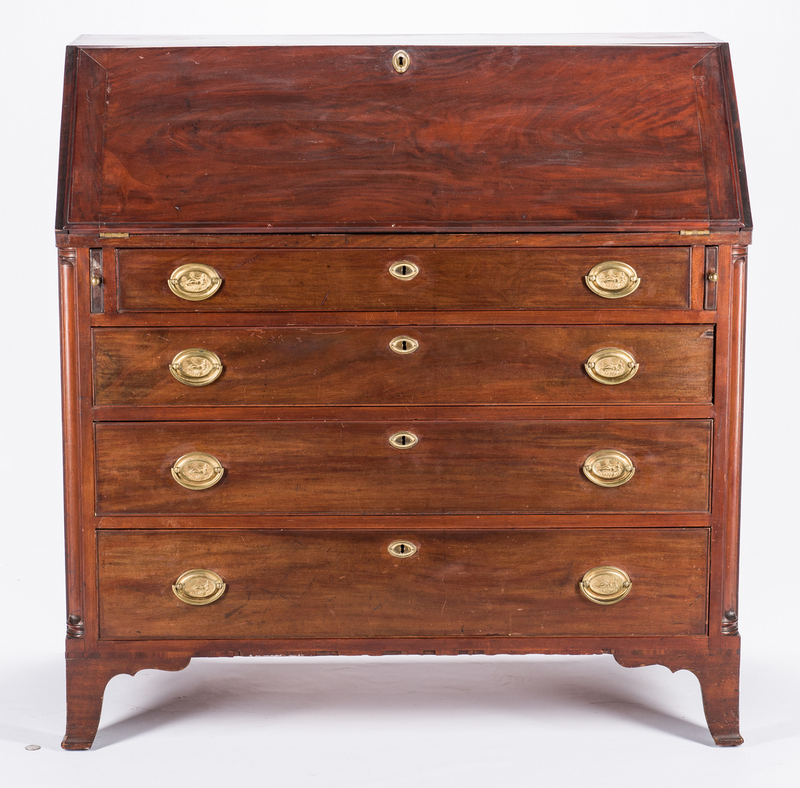 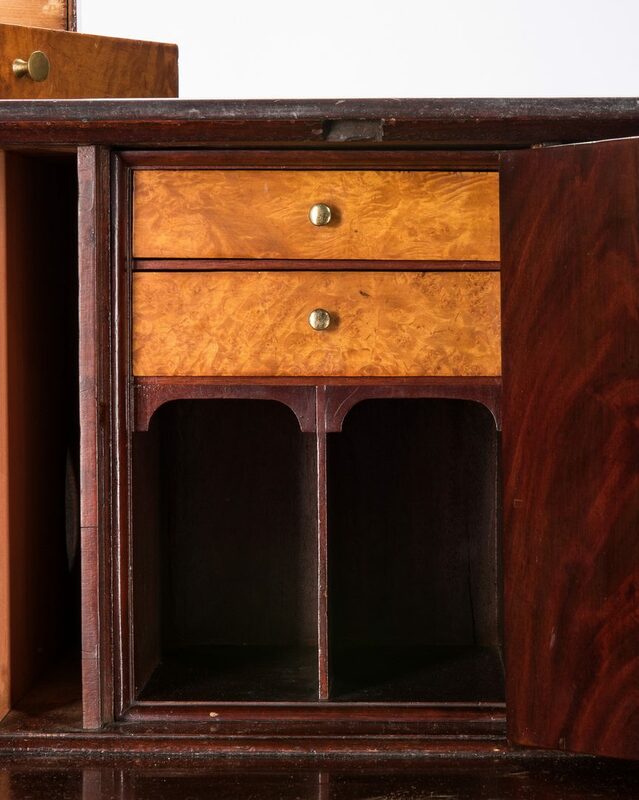 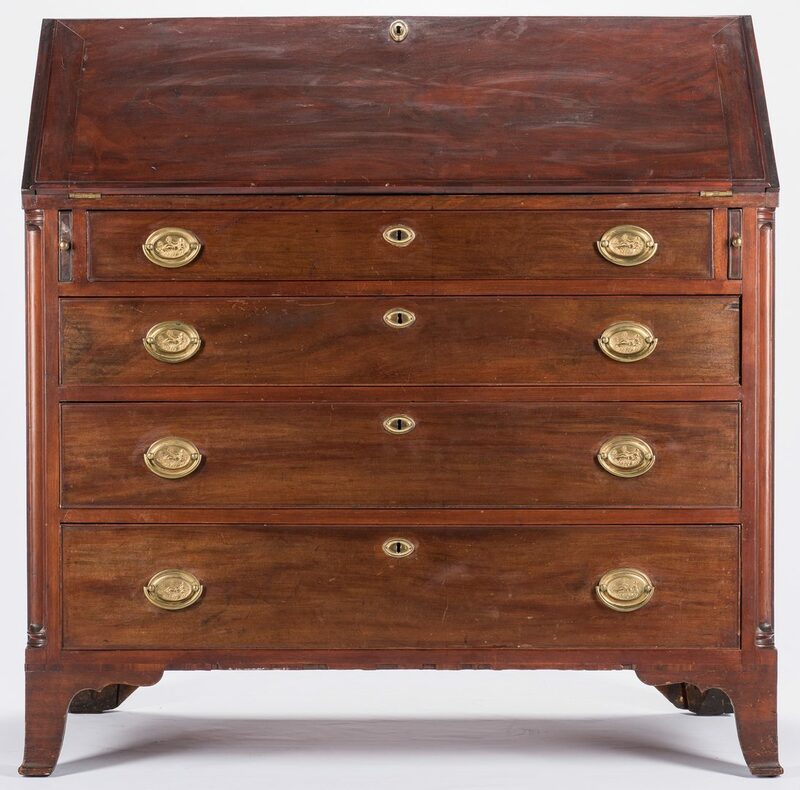 Philadelphia Federal slant front desk, signed Joseph W. Lyndall and dated 1812, mahogany with poplar secondary. Fall front opens to reveal fitted interior with figured mahogany prospect door, enclosing 2 bird's eye maple veneered drawers and two open cubbies, flanked by 2 vertical drawers and 8 small bird's eye maple veneered drawers over 8 cubby holes. 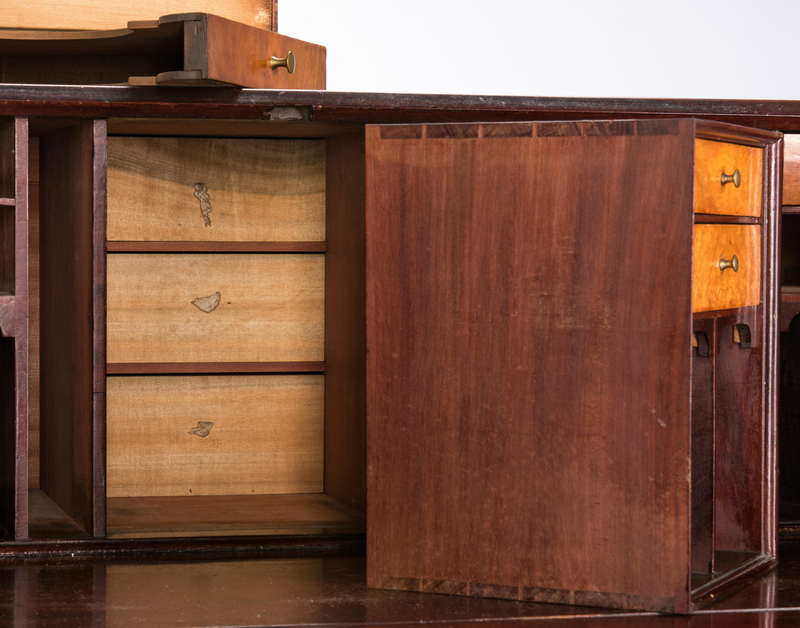 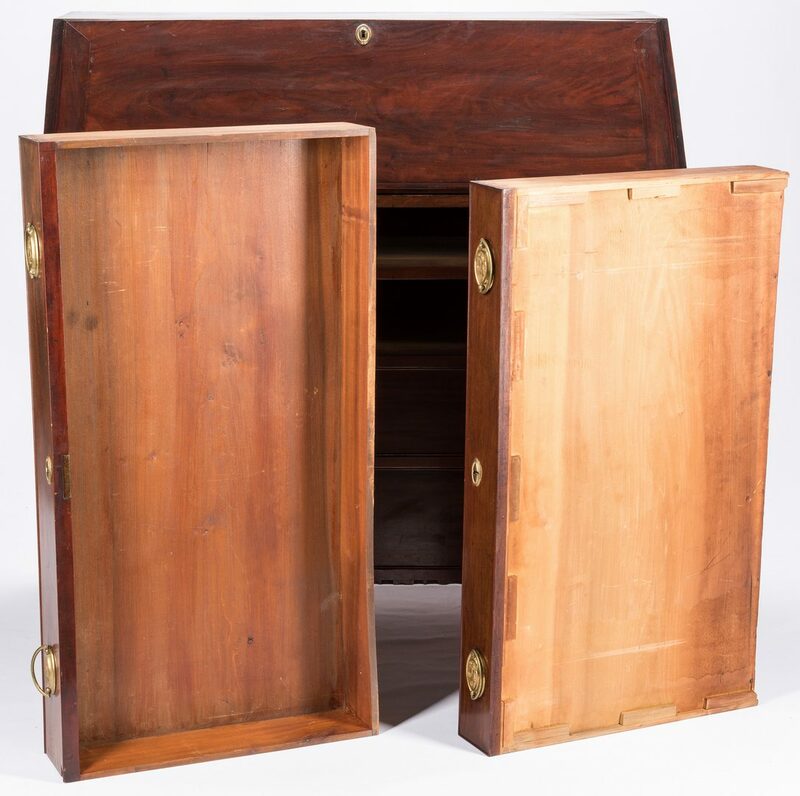 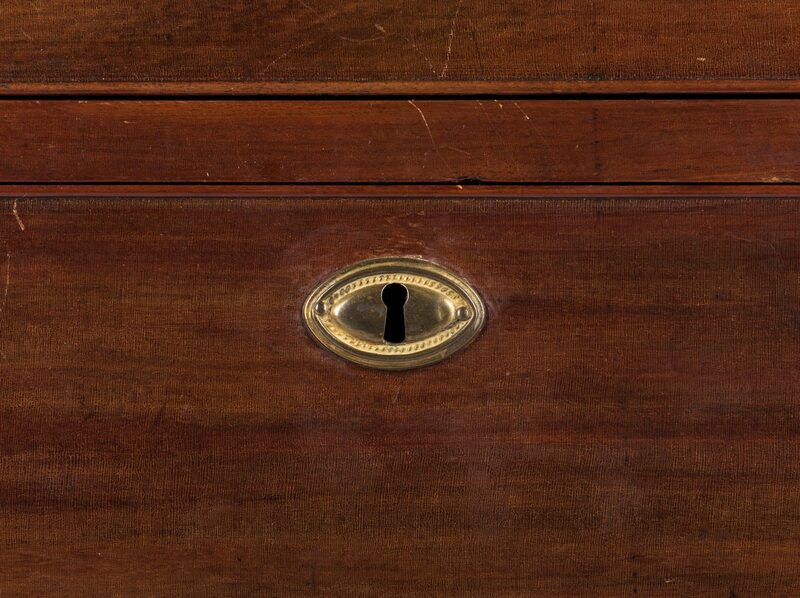 Prospect interior can be removed to reveal three hidden dovetailed drawers. 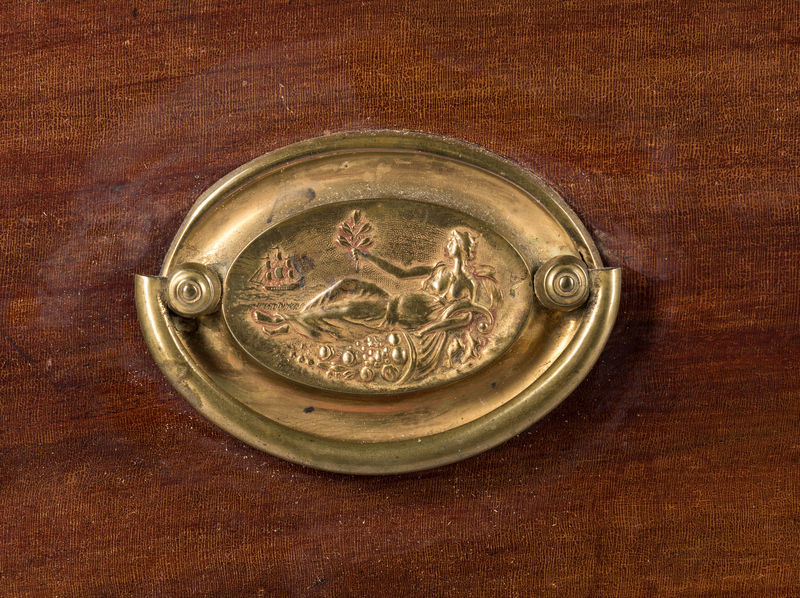 Four graduated beaded and dovetailed long drawers having oval escutcheons and brass pulls, each pull with scene of a Grecian goddess figure reclining atop a cornucopia and waving an olive branch to a distant ship at sea. 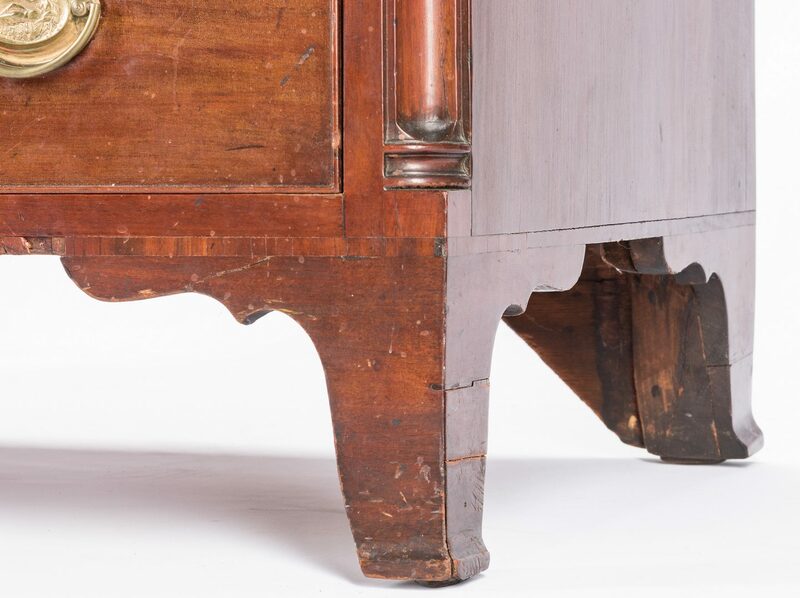 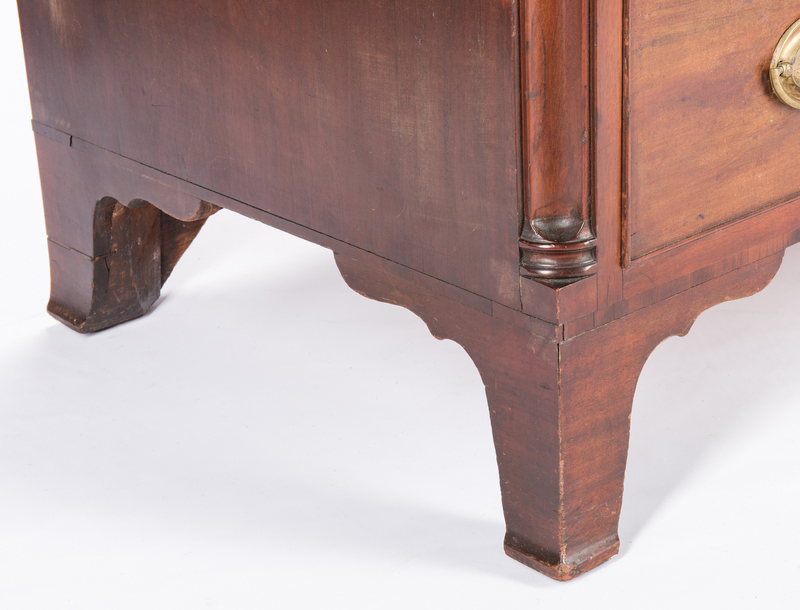 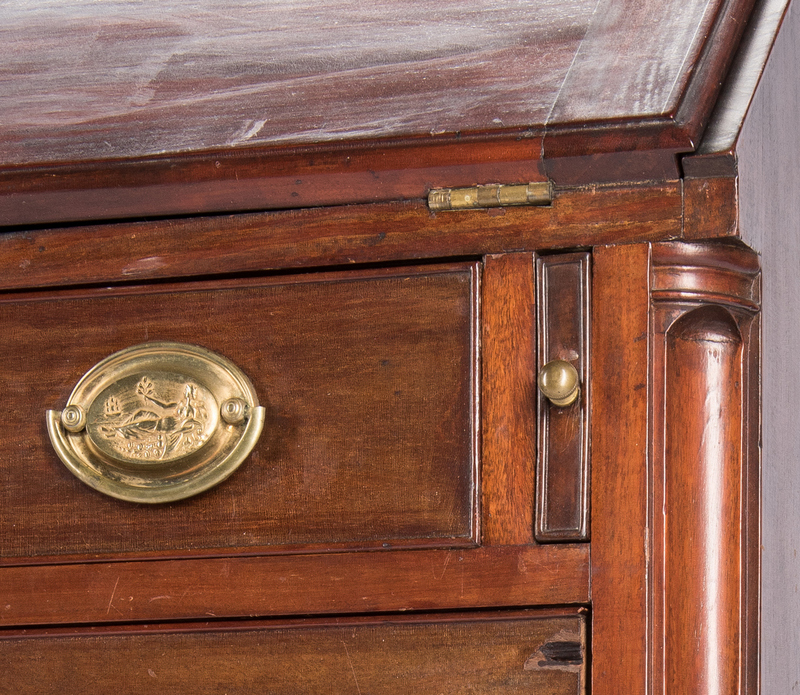 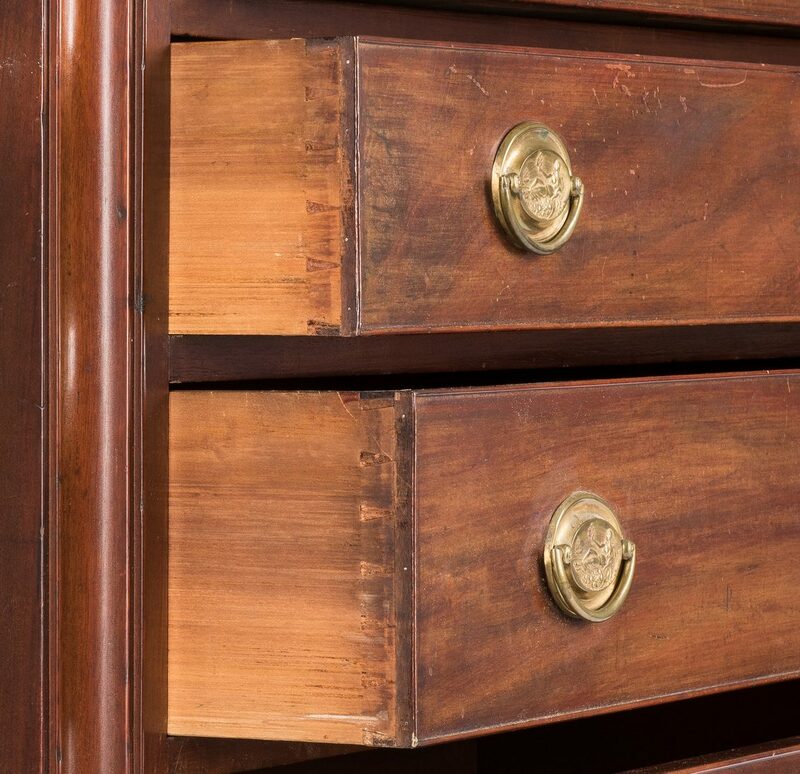 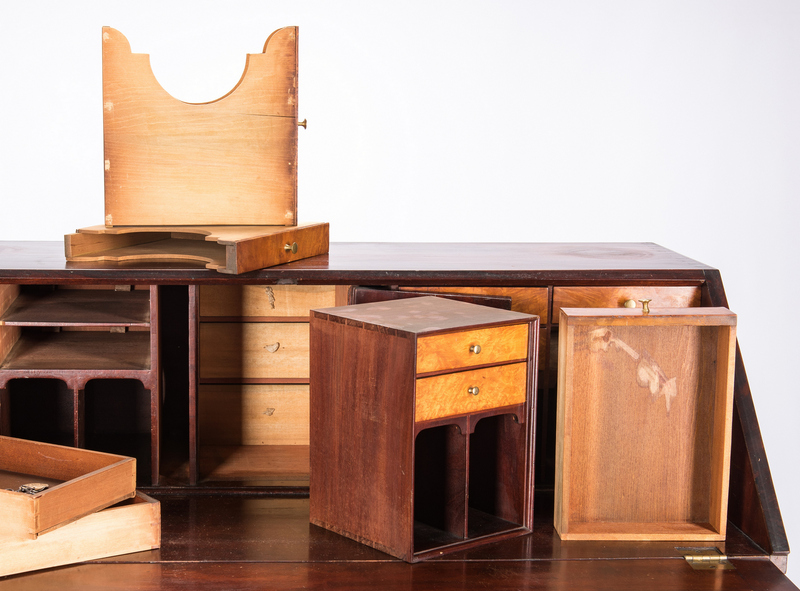 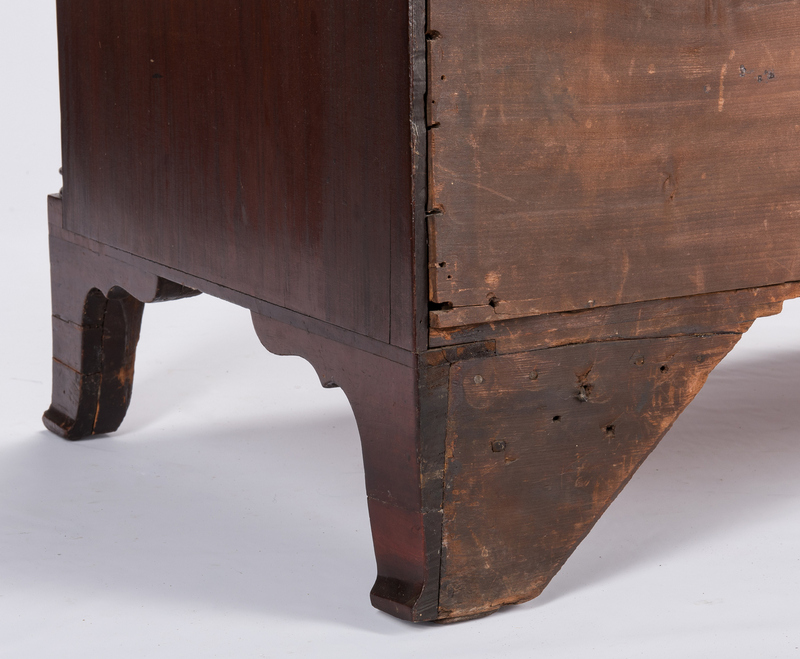 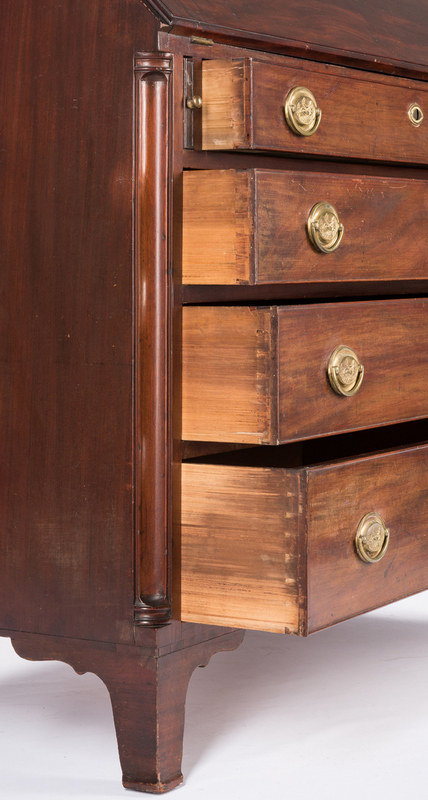 The drawers are flanked by concave molded quarter columns, over a straight, crossbanded skirt and shaped, slightly flaring bracket feet. 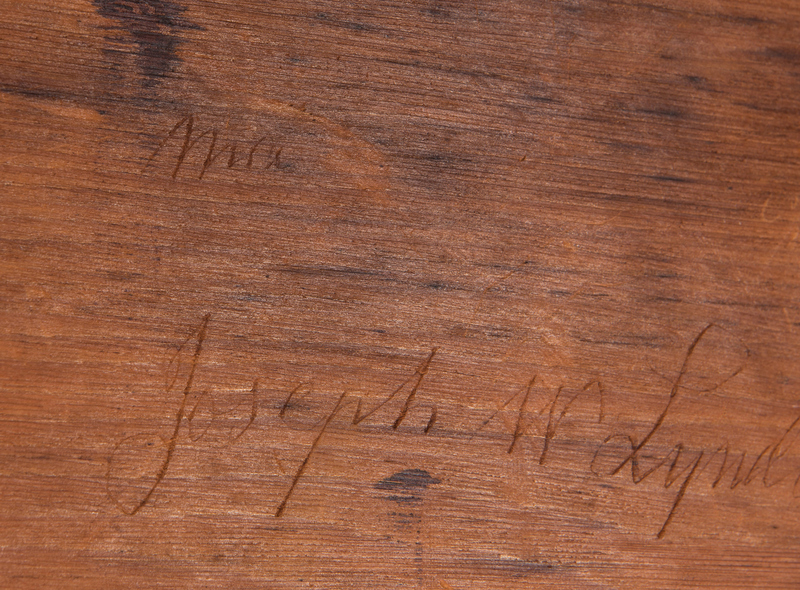 Signed in script "Made by Joseph W. Lyndall 1812" and "Joseph W. Lyndall" on underside of two hidden drawers in desk interior. 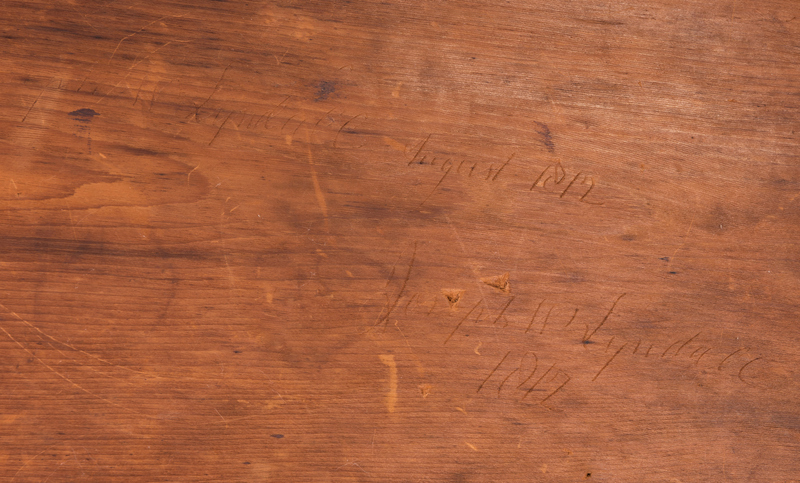 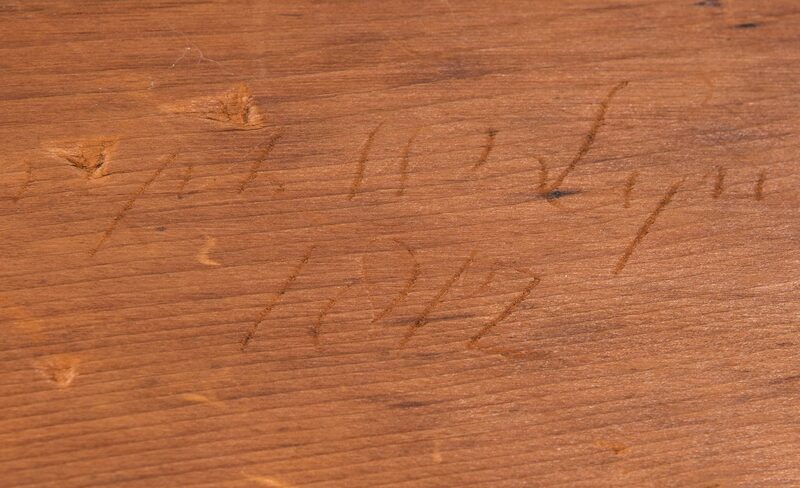 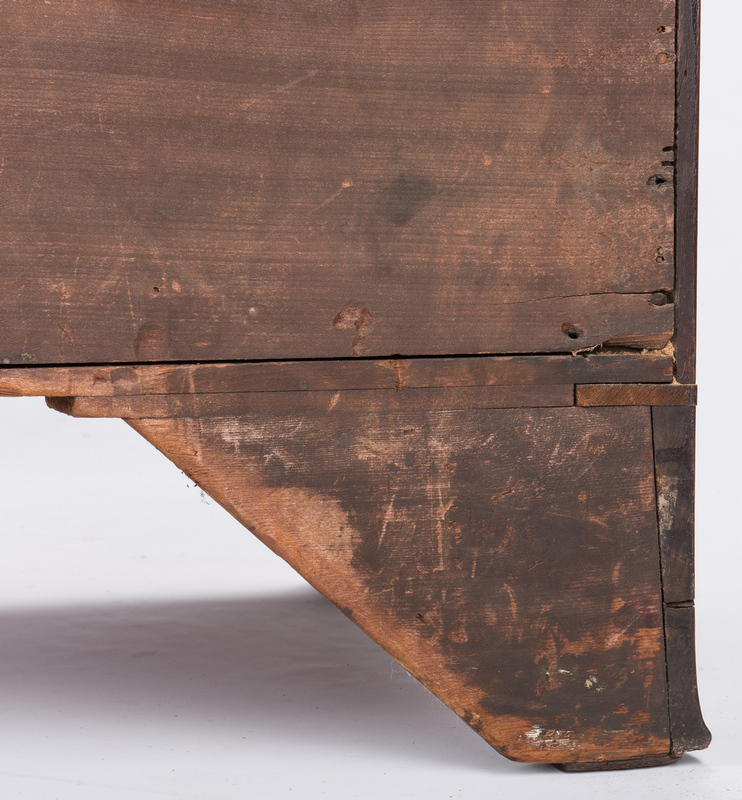 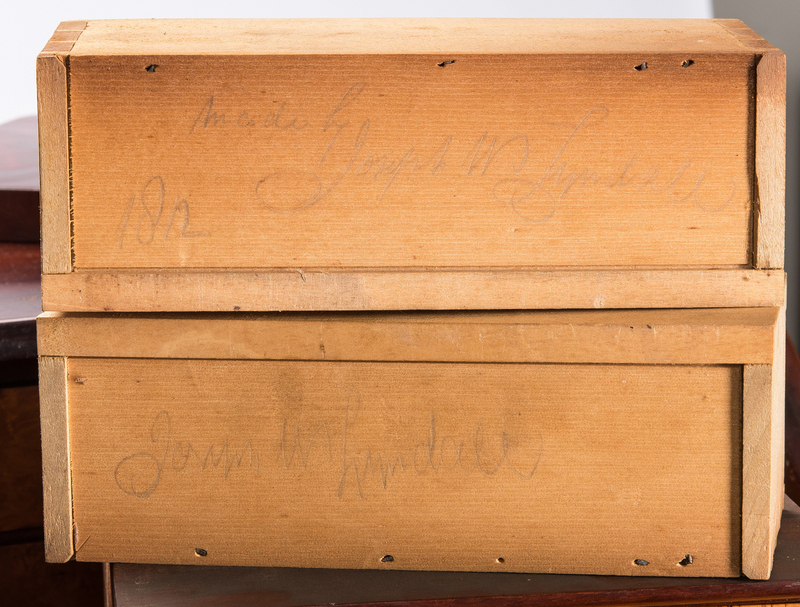 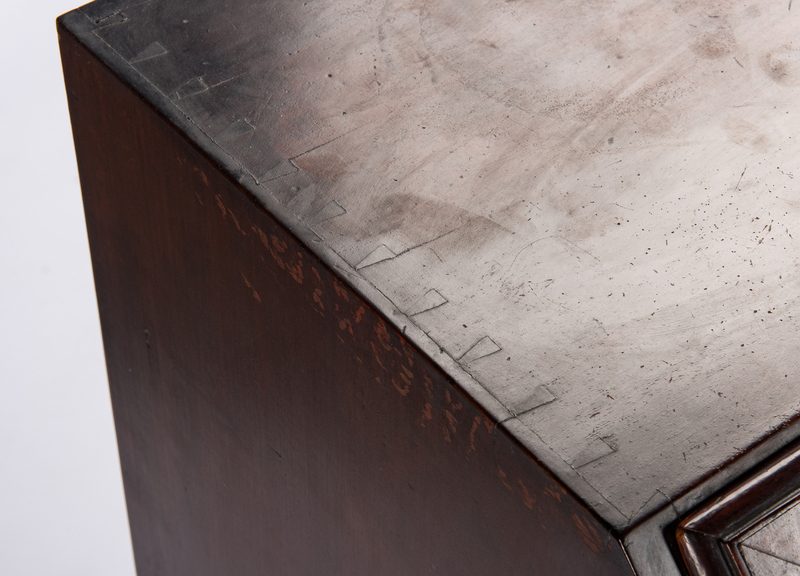 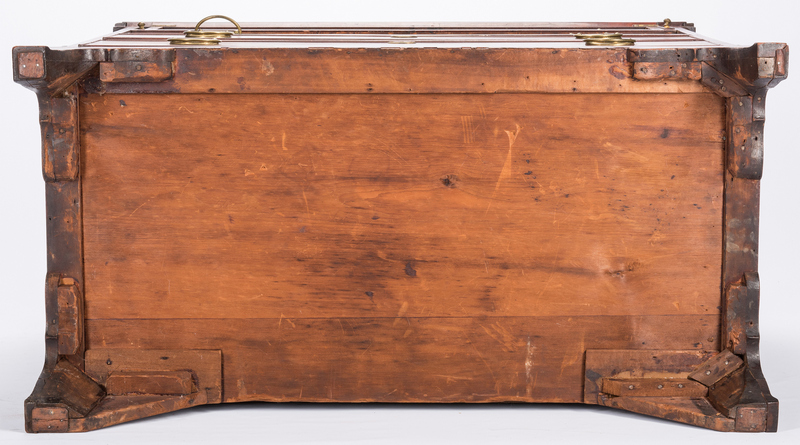 Additional signatures on the underside of desk case, "Joseph W. Lyndall August 1812" and "Joseph W. Lyndall 1812". 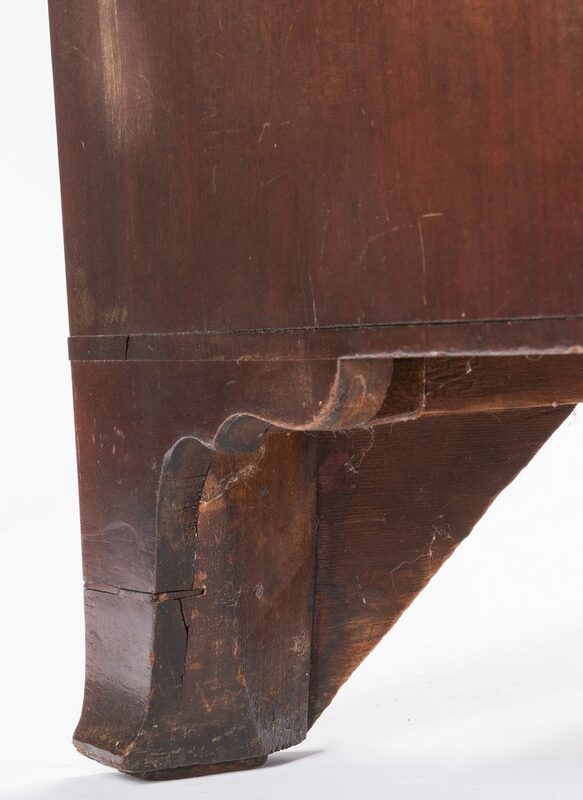 43 1/4" H x 42" W x 21 1/2" D. CONDITION: Overall very good condition with original feet. 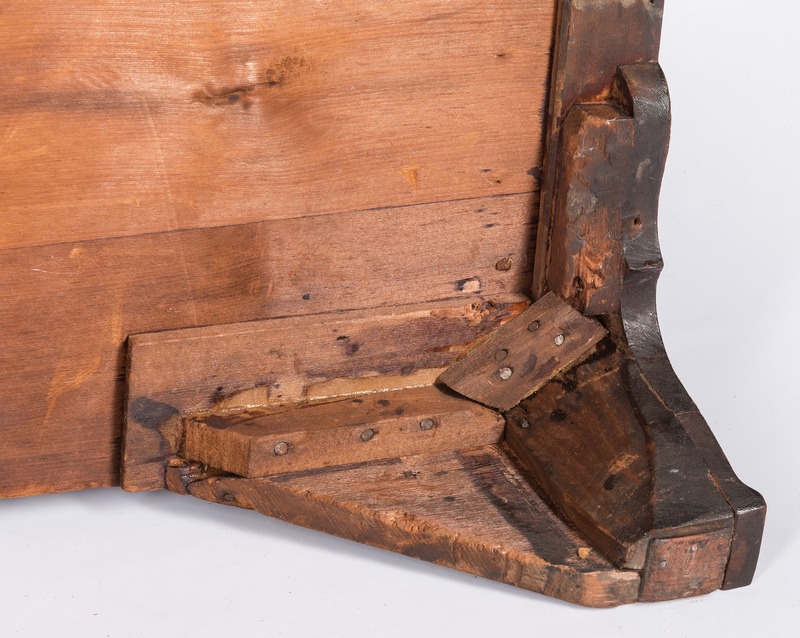 Lower two inches of right rear facing is an old replacement. 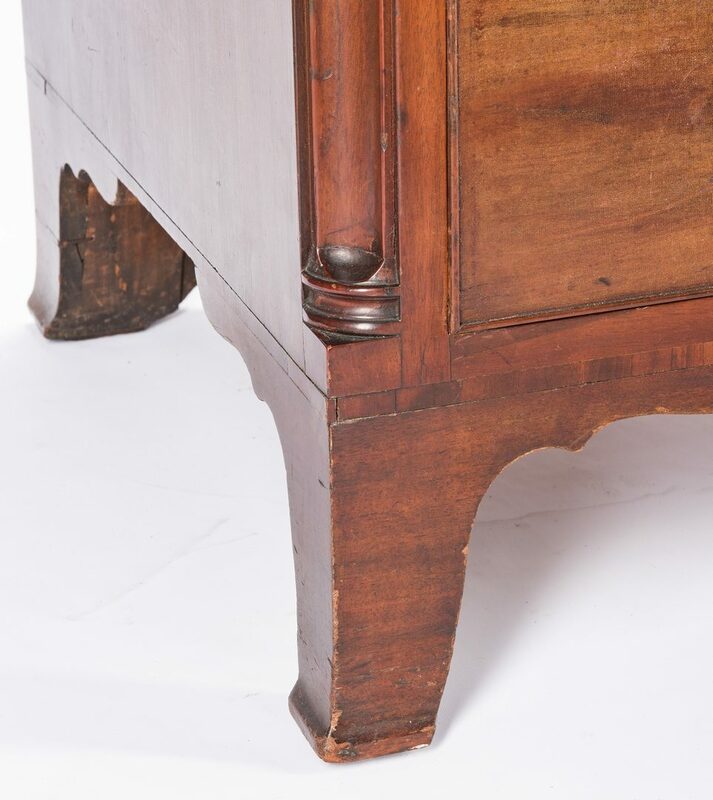 Small losses and repairs to cross banded inlay at skirt; 1/2" gouge to top drawer (right front side), scattered scuffs, scratches and abrasions, two 6" circular white stains and one 1" white stain to top.